Yes, we have a global obesity epidemic. Yes, I’ll watch any food-obsessed documentary. Sure, too much refined sugar is bad for you. But hold on about “everything we know about diet and exercise is wrong”, and “what if the solutions were the problem?”. 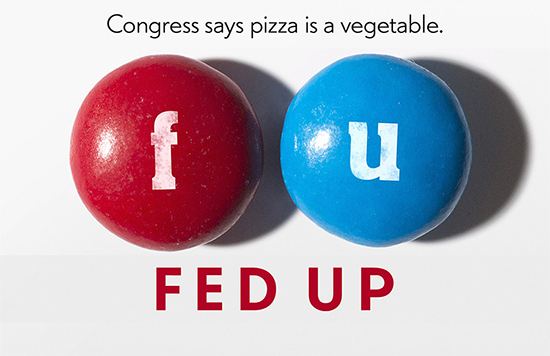 Katie Couric’s (producer and narrator) Fed Up is supposed to be an Inconvenient Truth about the food industry. The conspiracy she reveals is that people crave sugar (and salt and fat, but not mentioned in the movie), and they’ll act like addicts to get it. Plus, corporations will try to sell it to you to make money. (Shhh! Don’t tell anyone, it’s supposed to be a conspiracy!) But seriously, the one good point in the movie is that “personal responsibility doesn’t work in the face of addiction”. So the movie gets the food addiction point right. But that’s about it. There’s a bunch of scary statistics that don’t matter, and they want to blame a lot of scapegoats. What Fed Up wants to do is to impose federal regulation on sugary junk food. They think things are bad enough (save the children) to warrant this. So, you have to believe that 1) people can’t break their addiction to foods with added sugar, 2) some type of tax or labeling regulation will be easy to implement, 3) it’ll be effective in decreasing obesity, and 4) they’re won’t be any unintended consequences of this law. Good luck with any of those requirements. Please stop demonizing scapegoats like Ancel Keys, George McGovern, potatoes, rice, and “calories in / calories out” for our problems. The positive message has already been clearly, wonderfully delivered in movies like Forks Over Knives, and you can get personal instruction from anyone who’s learned to eat correctly (hint: we eat a lot). Eating right and exercising work, but we never get a chance because of the Pleasure Trap of food addiction. Once people (re-)learn how to cook whole foods, and experience the real tastes of delicious fresh foods, they break the addiction to the processed junk that’s killing the nation. No regulation needed. It’s a simple, all-natural solution.